My name is Jason, trail-name Wiki, and I’m part of your 2016 NOBO Blogging Class. I have been passively planning a thru hike since following the blog of 2014 NOBO Texaco closely from my desk in corporate purgatory. During this time I was having a really hard time waking up, commuting an hour and a half, sitting at a desk for 8 hours, then to drive an hour and a half home, to do a job that I could do in a very short time period and I didn’t really enjoy. I wouldn’t wish this kind of working environment on my worst enemy. Just a week after Texaco summited Katadhin I was offered a spot on my Army Reserve unit’s next deployment. I put in my 2 weeks notice at my job, knowing I wanted to finished school when I got back…and follow it up with a thru hike attempt. During my time away I consumed alot of AT related media. Appalachian Trials bloggers and the Pox and Puss Podcast. They kept me pretty engaged and involved with planning out my hike and experiencing other people’s second hand. They were a great distraction and hopefully I can add to that quality content myself now. 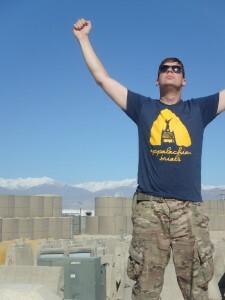 While away I ordered an Appalachian Trials T-Shirt and Zach sent it all the way to Afghanistan. 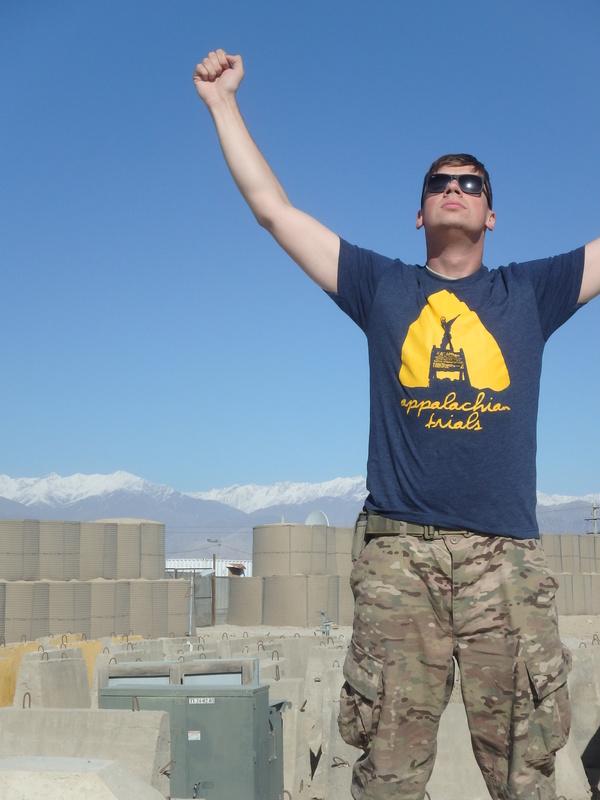 I posted a pic of me wearing it in the Facebook group and got an outpouring of supportand well wished, so I decided I would put in to blog with the Class of 2016. I imagine getting home from an AT thru hike is a lot like getting home from a deployment. Your life is a whirlwind of trying to put your former life back together and eat all the food you’ve been dreaming of while you were away. Meeting back up with friends and enjoying telling your stories and listening to theirs, filling in each other on what was missed in your time apart. Now the dust has settled from my return home and I’m gearing up to finish my final semester of school, and embark on my AT NOBO Thru hike in 2016. Until then though I am working towards prepping myself for the Trail. In the service I have learned that there is three kinds of fun, I imagine I will encounter all three types of fun on the AT and reference them in my posts, so I figure I’d start with defining them. Type 1 Fun: Fun that is fun at the time. Type 3 Fun: Something that’s not fun at the time, not fun to talk about, and only called fun to make you feel better about it. 3. Miss out on all the stories and people I have yet to meet. I also want to use this public forum to apologize to the bearded-kilt-wearing-thru-hiker that was trying to yogi me on the top of Mt. Lafayette last year when I hiked the Pemi Loop. I had packed extra snacks for thru hikers I met, but I was so tired at this point, I for some reason didn’t put together you were a thru hiker or that you looked hungry…my bad bro, hopefully apologizing has reset my trail magic karma, and if you read this let me get you a beer at some point.Thanks for reading and looking forward to posting some more soon, probably some gear prep related posts. If you have any Type 2 Fun stories, which are always the most fun to talk about, from the AT you want to share post them in the comments. My name is Jason (Trailname: Wiki) and I am planning a 2016 NOBO thru-hike attempt. I am completing my degree after my recent deployment and want to use the time to try a thru-hike before 'real life' sets in.